As the oldest American settlement, west of the Rockies, Astoria is located on the Columbia River, just a few miles from the Pacific Ocean. The city lines the south banks of the Columbia River, and the north banks of Young’s bay. Astoria is rich in scenic beauty, surrounded by water and tall evergreen Douglas Fir, Hemlock and Spruce trees, a vista of the Pacific Ocean and its endless miles of sandy beaches viewed from a top of Astoria’s historic Column. 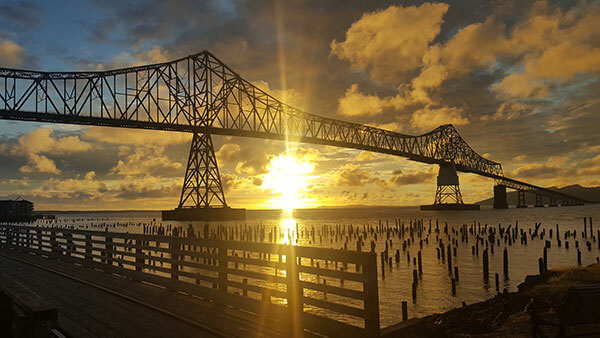 Discover why Astoria is a charming getaway. Visit Astoria’s many cafe’s and unique shops. Tour nationally acclaimed Columbia River Maritime Museum Explore maritime history from dugout canoes to sail ships. Walk the bridge of a World War II warship, marvel at the 44-foot motor lifeboat plowing through a wave in a rescue mission. The 4.1-mile-long Astoria-Megler Bridge features a main span of 1,232ft – the longest “continuous truss” in the nation – stretching from Astoria, Oregon, across the mouth of the Columbia River, to Point Ellice, Washington. Its construction was an impressive feat. The Astoria Column, famous for its fresco of historical scenes, sits in a wooded park atop Astoria’s highest hill. It presents a spectacular view of the historic city and its surrounding rivers, bay, forest, mountains and ocean. The Column, built in 1926, is 125ft high and has 164 steps winding to the top. Giant sturgeon are a common catch along the Astoria waterfront, where fisherman’s taverns serve a wide range of excellent local brews. History lives on in the Flavel House Museum. Capturing the luxury and elegance of the Victorian period it was built in the Queen Anne style of architecture in 1884 by Capt. George Flavel, a retired Columbia River bar pilot. Explore all Astoria has to offer for an exhilarating Northern Oregon Coast experience.